Kevin Harris, Associated Student Government vice president for community relations, speaks Wednesday evening during his Senate confirmation. Harris is the only freshman on the ASG executive board. 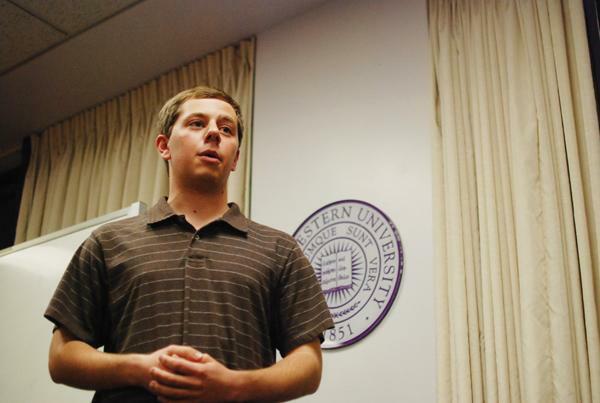 The Daily Northwestern: How do you plan to improve relations with off-campus students and Evanston residents? Kevin Harris: My vision is to expand beyond politics and really step back and look at what community relations is. Community relations doesn’t have to be limited to politics. I see us as doing more with volunteerism, dealing with businesses downtown, education. … I think there will be steps that can be taken to make sure we can continue to develop positive relationships and make sure Northwestern students are seen in a good way. The Daily: What kind of steps are you thinking about? Harris: So for example, whether it’s having some sort of, like Dinner with 12 Strangers is something that we do with alumni … small dinners where three or four Northwestern students go next door to their neighbor and get to … learn about each other. The Daily: Tell me what got you interested in that. Harris: I’ve had relatives that were very involved in politics, so that was where it starts. My grandfather worked in the Kennedy administration with JFK, and he was also Robert Kennedy’s campaign manager before Robert was killed. So hearing his stories when I was growing up was my initial interest in politics. The Daily: How do you think voter turnout among NU students was in the Evanston’s April 9 elections? Harris: There weren’t as many as we hoped, and the problem is that there’s a registration deadline back in early March, a month before the election, so people aren’t necessarily thinking about an April election that far in advance. The Daily: How do you plan to work with newly re-elected Ald. Judy Fiske (1st)? Harris: There have been tensions here and there over issues, but I do appreciate Alderman Fiske coming to our town hall forum and making an effort to reach out to students. She already said she’s organizing a meeting … with a representative from the 1st Ward dorms. The Daily: You were talking about making volunteering a more central part of the community relations agenda. How do you think that would be accomplished? Harris: One thing that we did this quarter … is meet with all of the Evanston aldermen. One thing that we asked them … were what kind of organizations in your specific ward can students can get involved in. So I think one thing, a tangible thing beyond just meetings, is creating a volunteer database. The Daily: Ald. Donald Wilson (4th) is going to come and meet with the new ASG Senate to talk about amendments to the so-called “brothel law.” What do you hope to accomplish in that meeting? Harris: Our biggest priority is making sure some sort of resolution comes as quickly as possible before the next school year … so students feel safe and secure and don’t have to worry about having to include that extra step of having to not include someone on the official paperwork. The Daily: How do you plan to work with Evanston businesses in your term? Harris: Increasing the number of restaurants working with the WildCARD … looking at if we can create some special discount for student groups who are looking to buy supplies for events. … Anything in the long term is possible for (using) WildCARDs downtown as almost like a debit card because that’s something that other universities around the country have.